Pop the ingredients for the lentils into a small saucepan and bring to the boil. Turn down to a simmer, and simmer for about 15-20 minutes until al the water has been absorbed. Remove from the heat and set aside. Get the rice on the boil too: pop all of the ingredients into a saucepan, give it a stir, bring the rice up to a boil and boil for 30 seconds. Pop a lid on the saucepan, remove from the heat and place in a warm spot until all of the water has been absorbed. This, I find, is my favourite way of cooking rice: I get on with whatever else I am cooking, and let the rice steam, and by the time the rest is ready, the rice is too. While the lentils are cooking and the rice is steaming, get on with the beef. If you have bought your mince from the supermarket, as I did with this recipe, remove it from the packaging and massage and squeeze the mince with your hands: I find it makes the appearance of the final dish, for me, more aesthetically pleasing. I don’t go for that shredded minced beef look: and I find that by squeezing the mince, it alleviates this little problem. Of course, if you buy your mince from your butcher, this won’t be a problem. Heat the oil and ghee (or butter) in a frying pan until slightly foaming. Add the onion, chilli, garlic and spices. Saute for about 4 minutes, and then add the beef mince. Turn the heat up a little higher, and fry the beef for 10 minutes. Keep stirring, as you want that all important stick and browning to happen. After ten minutes, add the crumbled beef stock, cube salt and peppers, and fry for a further 15 minutes: you really want the beef to be a “dry” spiced beef, not a sauce at all. While you are frying the beef mince, you can get on with the crispy onions too: n a separate small frying pan, heat the oil. Add the sliced onion, salt and garlic. Fry for about 10- 15 minutes- you may need longer: you want a good caramelisation to the onion. Set aside when done. Now, once everything is ready and cooked, you are ready to mix your ingredients together. I use a very large mixing bowl to do this properly, and then I ladle it into serving bowls. Remove and discard the cinnamon stick from the rice, and add the rice to the bowl, along with the mince, lentils, lemon juice and zest and the chopped herbs. Mix well. 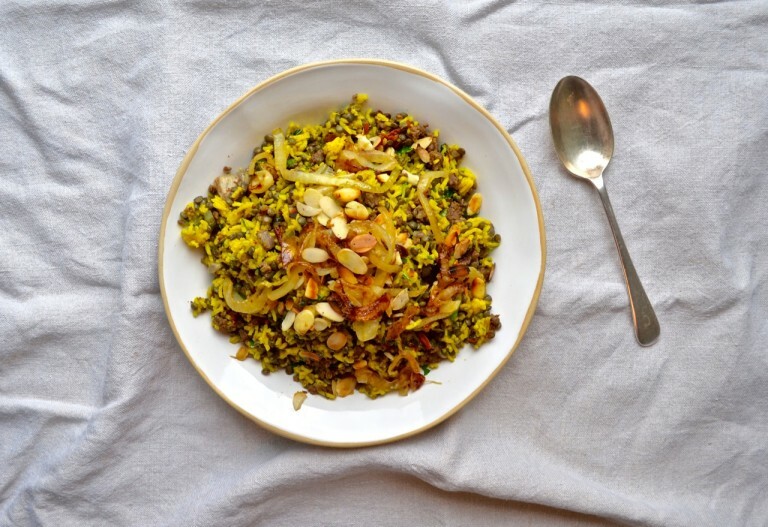 Ladle into serving bowls, top with crispy onions and toasted flaked almonds. Absolutely heavenly: eat with a spoon, please.